That doesn’t mean you shouldn’t use them to win sales appointments. 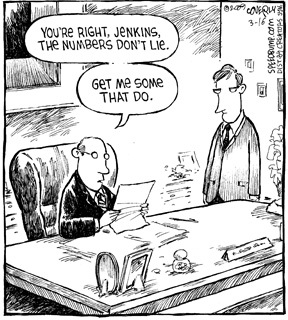 Believing numbers can’t be changed – When you present statistics, a prospect might have a tendency to either take it all as it’s been given or to take upon themselves the challenge to be an exception. The former could be a cynic and the latter is somebody who insists that they don’t your solution. How to avoid either? Simple. Stop taking numbers as an absolute given. For the cynic, you offer an opportunity to change. For the optimist, you at least share something in common. Assume that numbers are an end in of themselves – Whether it’s reaching a quota, getting good website metrics, working certain hours, some might overlook what the numbers actually represent and confuse them for any actual accomplishment. This is a weakness that more skeptical prospects will almost automatically use against whatever stats you present. The best way to prepare is at least know how to properly measure success. In fact, the good place to practice is by properly measuring your own marketing tactics (such as SEO). Attempt to measure subjective value – It’s easier to measure a half pint of water than it is to measure, say, the design of a particular logo. Sure, you can run some A/B tests to back up a case for it but what if a prospect takes too much of a personal issue? Remember, you’re not even closing the sale yet so to trying too hard to change their minds might not be a good idea. Sometimes it’s better to concede that some things just can’t be measured. Citing the ‘hard facts’ can get you attention but does that always mean the attention is good? You need to understand the use of metrics in their proper place. Only then can they really be worth racking up.